Missed participating in blog events - Check. Missed visiting blogger friends – Check. Missed leaving comments in their blog – Check. Missed posting recipes twice a week – Check. Missed writing new post for Beyond Curries – Check. Missed cooking recipes from other blogs (at least 2 recipes per month) – Check. Missed taking photographs of new recipe I cooked and loved for blog – Check!!!!!!!!!! Well, I can understand the first six things happening now and then when I am buried till my nose with all new projects and meeting deadlines. But I am still scratching my head thinking how I could have missed taking photos for my blog??? Looks like I am not only busy with hectic work schedule but may be little stressed also. HELP… Anybody?! And not to forget, I also have some recipe for all you lovely people. 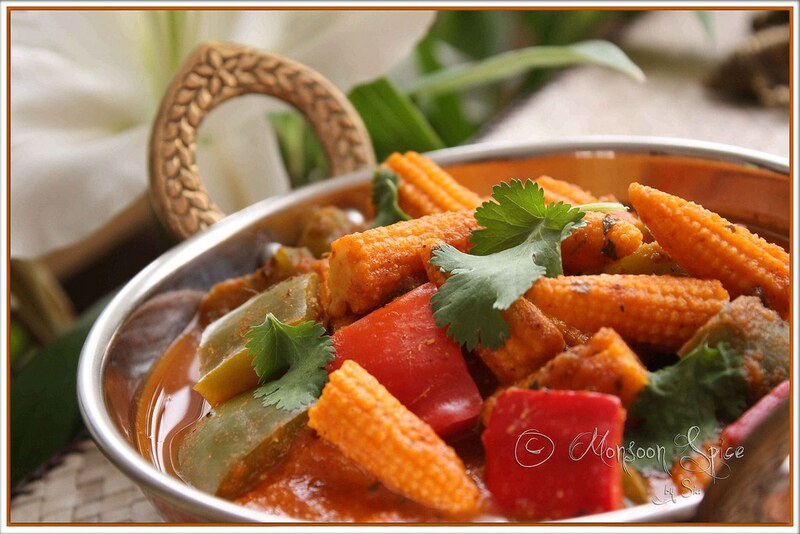 Today we have this simple, delicious and flavourful Capsicum & Baby Corn Curry to please all your senses! I am quite fond of coloured bell peppers and baby corns and I use them quite often in Indo-Chinese cuisines. Using these two veggies in Indian cuisine has got nothing to do with my creative brain cells or unusual taste buds. It was the result of lack of vegetables in fridge and also laziness to go out for shopping. But I am not here to complain as the chemistry between bell peppers and baby corns was quite hot and sizzling and they literally set our taste buds on fire! ;) While creamy onion and almond gravy tasted superb, the crunch from capsicum and baby corns were very pleasing to our palettes. When served with soft and warm Phulkas and simple Cumin Rice, it was nothing short of touching the stars! Try this curry when you are tired of eating same combination of vegetables or pulses and see this colourful Capsicum & Baby Corn Curry winning positive approval from everyone sitting around your dining table. :) And off this goes to dear Vysh who has spiced up all our blogs by asking us to cook some spicy dishes for her JFI: Chilli, an event initiated by dear Indira of Mahanandi and dear Priya who is guest hosting AFAM-Bell Peppers, an event started by Maheshwari of Beyond Usual. Heat ½ tbsp oil in a pan and add cinnamon stick, cloves and green cardamoms. Cook for a minute, on medium heat, and then add cumin seeds to it. When cumin starts to sizzle and turn golden red, add roughly chopped onions and fry till they turn transparent, about 2 mins. Next add ginger-garlic paste and stir for a minute or two till raw smell disappears. Switch off the flame and transfer the content to food processor or mixer jar. Let it cool slightly. Add skinned almonds and grind the mixture to smooth paste without adding any water. Heat tbsp of oil in a pan and add ground onion-almond paste. Saute on medium flame till the paste turns light golden brown in colour and becomes one dry mass, about 5-6 mins. Add garam masala, kitchen king masala, turmeric powder, coriander powder and cumin powder and stir for 30 seconds. Mix in pureed tomatoes and give it a good stir, about 3 mins. Add 1-1½ cups of water, amchur powder, sugar and mix in salt to taste. Keep the flame on medium and bring the whole gravy to gentle boil, about 5 mins. Add baby corn pieces and cover and cook for 5 mins. After 5 mins, add peppers/capsicums and cook uncovered for another 5-7 minutes till vegetables are cooked through but retain their crunch. 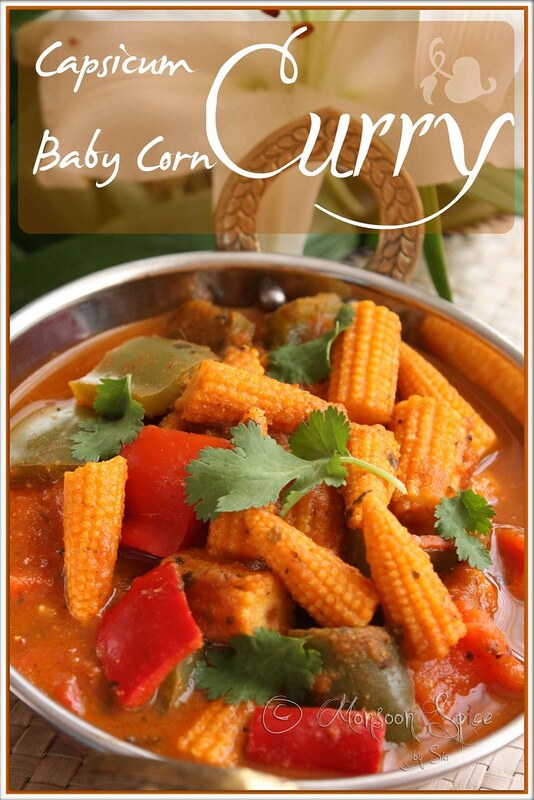 Serve this delicious Baby Corn-Capsicum Curry hot, garnished with finely chopped coriander leaves, with any Indian flat bread or flavoured rice and enjoy. Pleeeeeease do not stop blogging.The world is full of items and recipes to be made.Love the curry.Expecting more and more from you and wishing monsoon spice many many many years. Love the curry,esp the paste with almonds.Never tried the combo of pepper and corn together together. It happens to everyone I guess not only with blogging but other things we do. Taking a small break might help. Curry looks delicious. A delicious recipe and a wonderful click! Of course people will miss your posts, I know I would! And I hope if you decide to stop that you would leave up what you have already posted, as I have tons of your recipes yet to try :) I've felt like that before, in my first year, and I just took a break for awhile, then resumed when I wanted to. The curry looks beautiful and delicious, you took an awesome pic! I suppose that like any other relationship, blogging takes love and work. 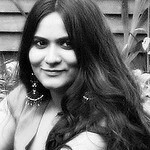 I sincerely hope that you continue blogging for a very long time because I adore your space, Supriya! I know that I have found motivation hard at time when I get overwhelmed with things going on in my life. Yet, at the same time, I find blogging to be therapeutic. So, that's my reason to keep coming back. Don't stop blogging! Just go slow - it doesn't have to be twice a week. Or take a break to recharge and come back! I love the combination of these veggies. question: do you always have fresh flowers in your house or is that a plant / plastic one? We will all su(o)rely miss your presence on food blog. Please don't do that. And I was wondering how your dish looks so vibrant. Tomato puree it is. No? wow! this recipe sounds delicious...yummy..all you have to do is step outside for some of the ingredients..uphere i always had a hard time trying to find ingredients...one of my friend introduced me to a great resource www.myethnicworld.com and i thought that i pass great along as well...thanks for sharing the recipe. btw the curry does look awesome..not sure why you don't remember to take pictures.thats very naughty! Lovely and delicious curry.. both the ingredients are my favorites. Sure would I love this one. Sia, I hope and wish that you not stop blogging. hmmm this happens to everybody but don't worry dear. Atleast once in a month you would get the itch to post something in your blog. Thats my experience. And this onion-almond paste created a whole lot of ideas for several gravies. The colour and cripsiness of the pics are drool worthy...no doubt. Go to a marriage counsellor! Don't divorce your blog! Your children (blog readers) will never get over the trauma...hahaha and I've got your blog in my favourites list!!! This is my first comment though! The curry looks great, never made anything with almond paste... must try, I love baby corn. that looks absolutely amazing! i love baby corn and bell peppers but i would never have thought of making a curry. yum -- thanks for posting! Oh you would be seriously missed. Go at your own pace but please do not deprive us of your wit, humour and food! Please be nice & try to be more adaptive? 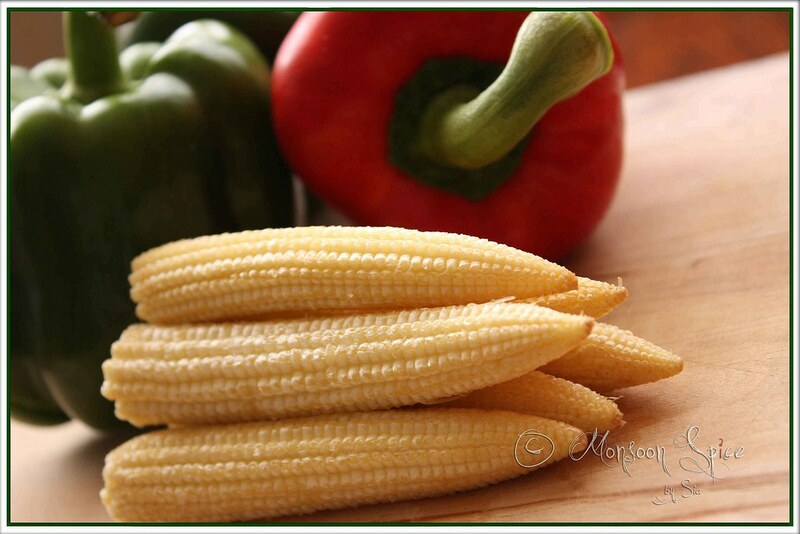 Love munching on baby corns & i have to admit that i have not made desi stuff with this combo. almond gravy sounds great. on serious notes.. i am so lack in time with my kids.. i am almost ready to give up blogging.. but just fearing what u wrote about, i keep pushing myself, for if i stop once & cannot get back to the tracks again.. & am not even done a year. i have one small query if u can help me. Firstly if i want to substitute the bell pepper with other veggies can i do it...i mean adding paneer/ peas/ mushroom..
Secondly i don't have almonds at home so if i replace it with cashews..how much the taste suffers by doing this changes..
Thanx for ur help adn hope u reply me..
Have a Great day n Cheers!